Product #1621 | SKU 1365652 | 0.0 (no ratings yet) Thanks for your rating! The Creative Wide-angle Artist: This moderate wide-angle lens offers exciting visual perspectives, but is also one of the easiest to control. The Biogon T* 2,8/25 ZM delivers high contrast across the entire image field and is virtually free of distortion at full apertures. With the aperture stopped down, detail is finely rendered with a pleasing three-dimensional quality. The lens is rangefinder-coupled for easy focusing and the optional 25/28 mm viewfinder is available for accurate image composition. 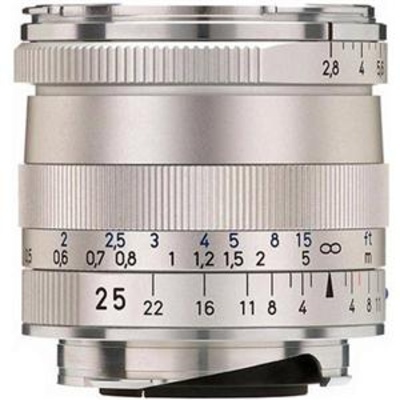 Combined with a digital rangefinder camera with a 1.3 crop factor, the lens has an effective focal length of 33 mm. The Biogon T* 2,8/25 ZM is a creative tool for scenic portraits, inspiring landscapes and expansive architectural photography.